When Will I Get My Table Tents? 5,000 and under Table Tents: Ships or ready for pick up in 2 business days from proof approval. Over 5,000 Table Tents: Ships or ready for pick up in 5 business days from proof approval. Table tents are an important item on the marketing menu of restaurants, bars and hotels. 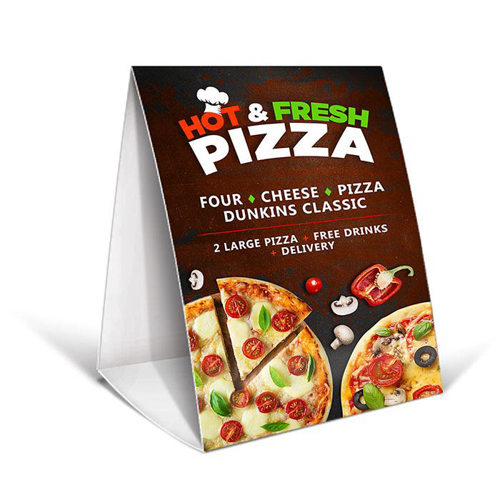 When your featured items need to look irresistible, choose 48HourPrint.com for high quality table tent printing at irresistibly affordable prices. In addition to excellent quality and prices, you also get the benefit of our industry-leading 48 Hour Turnaround Guarantee for quantities of 5,000 or fewer table tents. Table tent printing can help boost sales of hospitality items and services. At restaurants, bars and nightclubs, table tents are perfect for advertising food and drink specials and enticing guests to try a featured item. For conferences, table tent printing can create attractive table place cards and provide event agenda highlights. In hotel rooms, table tents are an effective way to advertise pay per view movies, room service menus, or information about your facility or the surrounding area. Preserving the environment is important to 48HourPrint.com. Our table tents are printed on recycled cover stock, which delivers excellent table tent printing results on stock that is brighter and more uniform in color. Recycled cover stock is our standard stock, at no extra cost to you. Our table tents are printed in full color on one side on 14 point cover stock, with your choice of matte coating, gloss coating, or high-gloss U.V. coating. For promotional tips on using table tents, check out our table tent marketing ideas. Also review our table tent templates for layout guidelines that will help keep your print job on schedule.